, an ingenious natural philosopher, was born at Stroud, in Gloucestershire, July 31, 1713; and was placed, when young, under the care of a Mr. Davis, of the same place, a very able mathematician, with whom, before he attained the age of nine years, he had gone through both vulgar and decimal arithmetic. He then proceeded to the mathematics, and particularly to algebra and astronomy, wherein he made a considerable progress, when his father took him from school, and put him to learn his own business, that of a broad-cloth weaver, but this circumstance did not damp his zeal for the acquisition of knowledge. All his leisure time was devoted to the assiduous^cultivation of astronomical science; and, by the help of the Caroline tables, annexed to Wing’s astronomy, he computed eclipses of the moon and other phsenomena. His acquaintance with that science he applied, likewise, to the constructing of several kinds of dials. But the studies of our young philosopher being frequently pursued to very late hours, his father, fearing that they would injure his health, forbade him the use of a cmidle in his chamber, any longer than for the purpose of going to bed, and would himself often see that his injunction was obeye<l. The son’s thirst of knowledge was, however, so great, that it made him attempt to evade the prohibition, and to find means of secreting his light till the family had retired to rest; when he rose to prosecute undisturbed his favourite pursuits. It was during this prohibition, and at these hours, that he computed, and cut upon stone, with no better an instrument than a common knife, the lines of a large upright sun-dial; on which, besides the hour of the day, were shewn the rising of the sun, -his place in the ecliptic, and some other particulars. When this was finished, and made known to his father, he permitted it to be placed against the front of his house, where it excited the admiration of several gentlemen in the neighbourhood, and introduced young Mr. Canton to their acquaintance, which | was followed by the offer of the use of their libraries. In the library of one of these gentlemen, he found Martin’s Philosophical Grammar, which was the first bodk that gave him a taste for natural philosophy. In the possession of another gentleman, a few miles from Stroud, he first saw a pair of globes; an object that afforded him uncommon pleasure, from the great ease with which he could solve those problems he had hitherto been accustomed to compute. The dial was beautified a few years ago, at the expence of the gentlemen at Stroud; several of whom had been his school-fellows, and who continued still to regard it as a very distinguished performance. 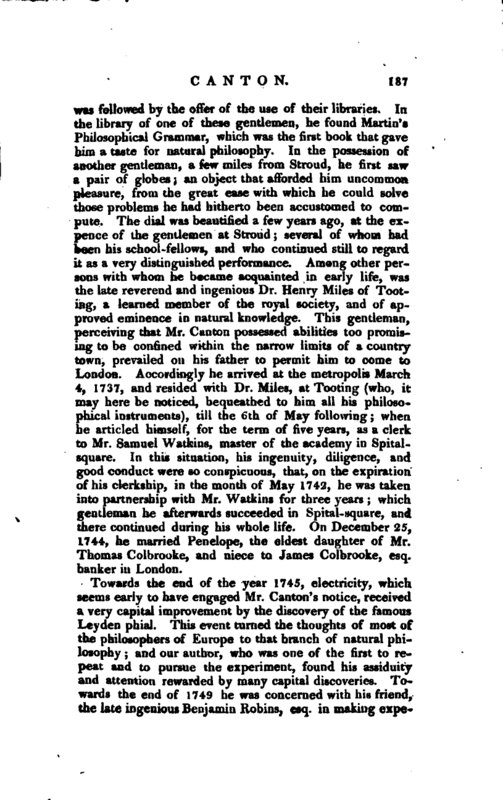 Among other persons with whom he became acquainted in early life, was the late reverend and ingenious Dr. Henry Miles of Tooting, a learned member of the royal society, and of approved eminence in natural knowledge. This gentleman, perceiving that Mr. Canton possessed abilities too promising to be confined within ^the narrow limits of a country town, prevailed on his father to permit him to come to London. Accordingly he arrived at the metropolis March 4, 1737, and resided with Dr. Miles, at Tooting (who, it may here be noticed, bequeathed to him all his philosophical instruments), till the 6th of May following; when he articled himself, for the term of five years, as a clerk to Mr. Samuel Watkins, master of the academy in Spitalsquare. In this situation, his ingenuity, diligence, and good conduct were so conspicuous, that, on the expiration of his clerkship, in the month of May 1742, he was taken into partnership with Mr. Watkins for three years; which gentleman he afterwards succeeded in Spital-square, and there continued during his whole life. On December 25, 1744, he married Penelope, the eldest daughter of Mr. Thomas Colbrooke, and niece to James Colbrooke, esq. banker in London. Towards the end of the year 1745, electricity, which seems early to have engaged Mr. Canton’s notice, received a very capital improvement by the discovery of the famous Leyden phial. This event turned the thoughts of most of the philosophers of Europe to that branch of natural philosophy; and our author, who was one of the first to repeat and to pursue tjie experiment, found his assiduity and attention rewarded by many capital discoveries. Towards the end of 1749 he was concerned with his friend, the late ingenious Benjamin Robins, esq. in making | experiments in order to determine to what height rockets may be made to ascend, and at what distance their light may be seen. On January 17, 1750, was read at the royal society, Mr. Canton’s method of making artificial magnets, without the use of, and yet far superior to, any natural ones. This paper procured him, March 22, 1750, the honour of being elected a member of the society; and, on the St. Andrew’s day following, the farther honour of receiving the most distinguished testimony of their approbation, in the present of their gold medal. On April 21, in the same year, he was complimented with the degree of M. A. by the university of Aberdeen; and, on November 30, 1751, was chosen one of the council of the royal society. On July 20, 1752, our philosopher was so fortunate as to be the first person in England, who, by attracting the electric fire from the clouds during a thunder storm, verified Dr. Franklin’s hypothesis of the similarity of lightning and electricity. Dec. 6, 1753, his paper, entitled, “Electrical experiments,” with an attempt to account for their several phenomena, was read at the Royal Society. In the same paper Mr. Canton mentioned his having discovered, by a great number of experiments, that some clouds were in a positive, and some in a negative state of electricity. Dr. Franklin, much about the same time, made the like discovery in America. 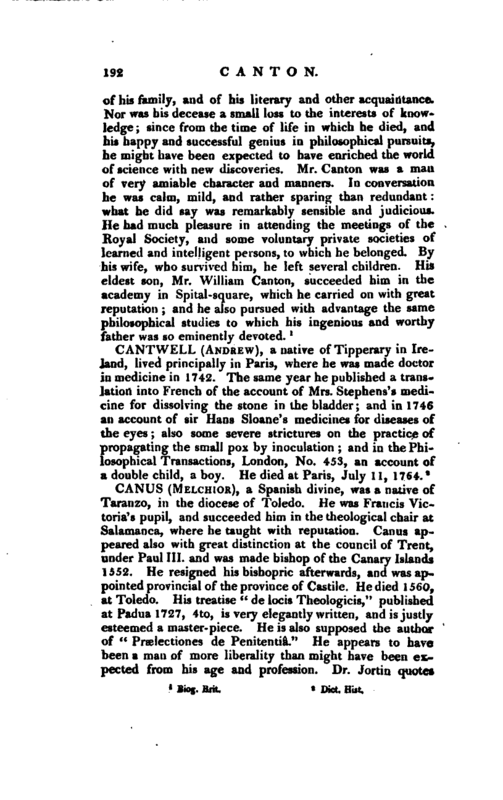 This circumstance, together with our author’s constant defence of the doctor’s hypothesis, induced that eminent philosopher, immediately on his arrival in England, to pay Mr. Canton a visit, and gave rise to a friendship which ever after continued without interruption or diminution. 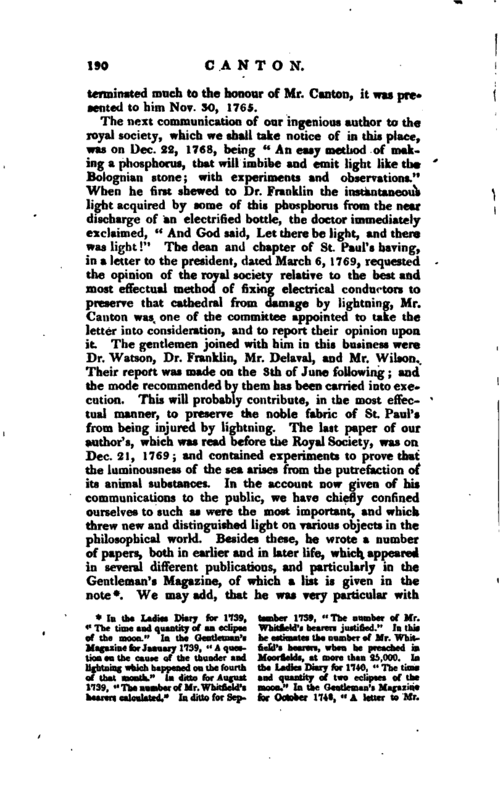 On November 14, 1754, was read at the royal society, a letter to the right honourable the earl of Macclesfield, concerning some new electrical experiments. On St. Andrew’s day, 1754, he was a second time elected one of the council of the royal society for the year | ensuing. In the Lady’s Diary for 1756, our author answered the prize question that had been proposed in the preceding year. 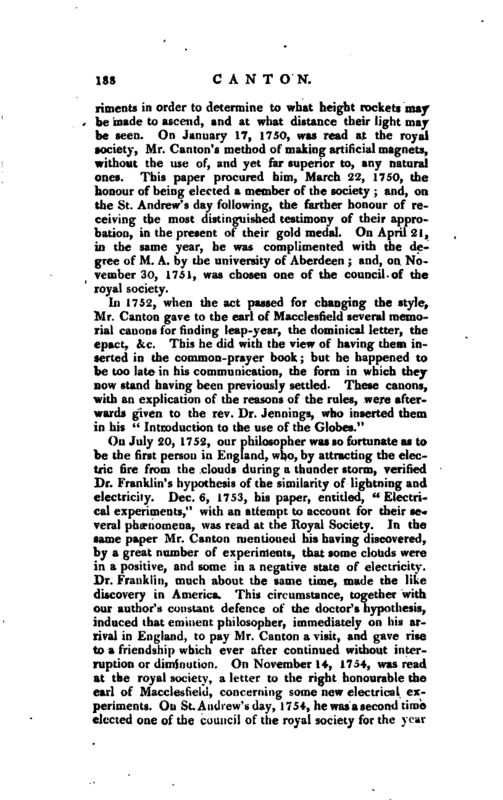 The question was, “How can what we call the shooting of stars be best accounted for; what is the substance of this phenomenon; and in what state of the atmosphere doth it most frequently shew itself?” The solution, though anonymous, was so satisfactory to his friend Mr. Thomas Simpson, who then conducted that work, that he sent Mr. Canton the prize, accompanied with a note, in which he said he was sure that he was not mistaken, in the author of it, as no one besides, that he knew of, could have answered the question. Our philosopher’s next communication to the public was a letter in the Gentleman’s Magazine for September 1759, on the electrical properties of the tourmalin, in which the laws of that wonderful stone are laid down in a very concise and elegant manner. On Dec. 13, in the same year, was read, at the royal society, “An attempt to account for the regular diurnal variation of the horizontal magnetic needle; and also for its irregular variation at the time of an aurora borealis.” A complete year’s observations of the diurnal variations of the needle are annexed to the paper. On Nov. 5, 1761, our author communicated to the royal society an account of the transit of Venus, June 6, 1761, observed in Spitai- square. Mr. Canton’s next communication to the society was a letter addressed to Dr. Benjamin Franklin, and read Feb. 4, 1762, containing some remarks on Mr. Delaval’s electrical experiments. 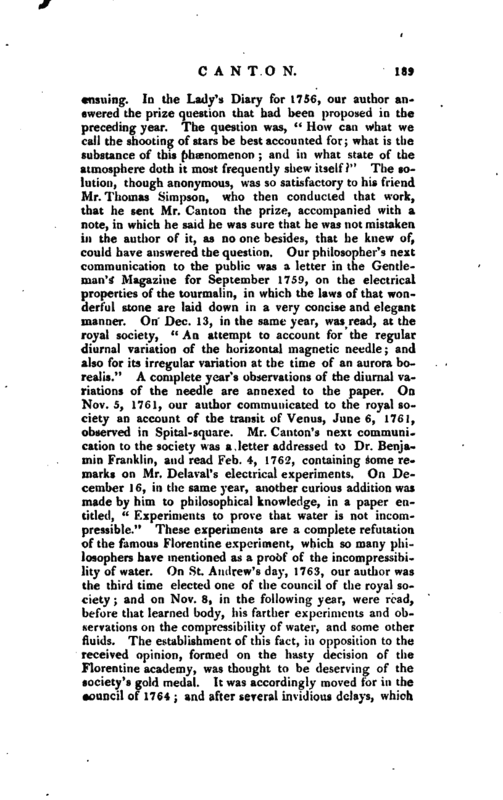 On December 16, in the same year, another curious addition was made by him to philosophical knowledge, in a paper entitled, “Experiments to prove that water is not incompressible.” These experiments are a complete refutation of the famous Florentine experiment, which so many philosophers have mentioned as a proof of the incompressibility of water. On St. Andrew’s day, 1763, our author was the third time elected one of the council of the royal society; and on Nov. 8, in the following year, were read, before that learned body, his farther experiments and observations on the compressibility of water, and some other fluids. The establishment of this fact, in opposition to the received opinion, formed on the hasty decision of the Florentine academy, was thought to be deserving of the society’s gold medal. Tt was accordingly moved for in the council of 1764 and after severalinvidious delays, which | terminated much to the honour of Mr. Canton, it was pro sented to him Nov. 30, 1765. 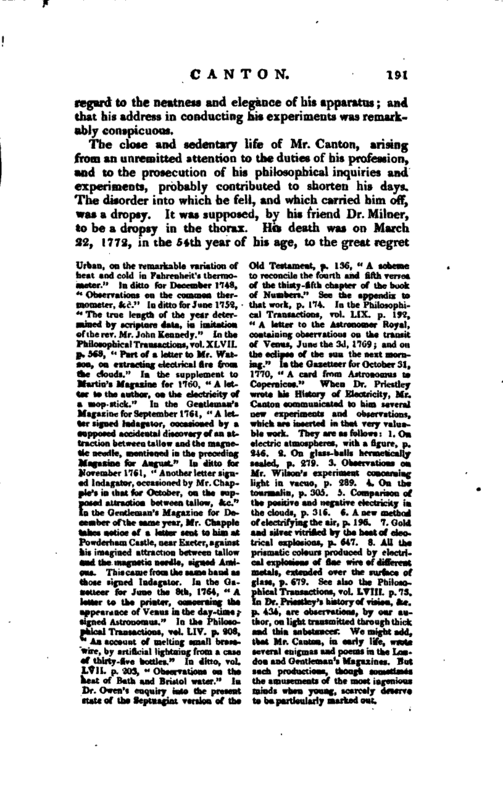 Urban, on the remarkable variation of heat and cold in Fahrenheit’s thermometer.“In ditto for December 1743, ”Observations on the common thermometer, &c.“In ditto for June 1752, ”The true length of the year determined by scripture data, in imitation of the rev. Mr. John Kennedy.“In the Philosophical Transactions, vol. XL VII. p. 568, Part of a letter to Mr. Watson, on extracting electrical lire from the clouds.” In the supplement to Martin’s Magazine for 1760, “A letter to the author, on the electricity of a mop-stick.” In the Gentleman’s Magazine for September 1761, “A letter signed Indagator, occasioned by a supposed accidental discovery of an attraction between tallow and the magnetic needle, mentioned in the preceding Magazine for August.” In ditto for November 1761, “Another letter signed Indagator, occasioned by Mr. Chappie’s in that for October, on the supposed attraction between tallow, &c.” In the Gentleman’s Magazine for December of the same year, Mr. Chappie takes notice of a letter sent to him at Powderham Castle, near Exeter, against his imagined attraction between tallow and the magnetic needle, signed Amicus. This came from the same hand as those signed Indagator. In the Gazetteer for June the 8th, 1764, “A letter to the printer, concerning the appearance of Venus in the day-time; signed Astronomus.” In the Philosophical Transactions, vol. LIV. p. 208, “An account of melting small brasswire, by artificial lightning from a case of thirty-five battles.” In ditto, vol. LVII. p. '203, “Observations on the heat of Bath and Bristol water.” In Dr. Owen’s enquiry into the present state of the Septuagint version of the Old Testament, p. 136, “A schema to reconcile the fourth and fifth verses of the thirty-fifth chapter of the book of Numbers.” See the appendix to that work, p. 174. In the Philosophical Transactions, vol. LIX. p. 192, “A letter to the Astronomer Royal, containing observations on the transit of Venus, June the 3d, 1769; and on the eclipse of the sun the next morning.” In the Gazetteer for October 31, 1770, “A card from Astronomus to Copernicus.” When Dr. Priestley wrote his History of Electricity, Mr. Canton communicated to him several new experiments and observations, which are inserted in that very valuable work. They are as follows: 1. On electric atmospheres, with a figure, p, 246. 2. On glass-balls hermetically sealed, p. 279. 3. Observations on. Mr. Wilson’s experiment concerning light in vacuo, p. 289. 4. On the tourmalin, p. 305. 5. Comparison of the positive and negative electricity in the clouds, p. 316. 6. A new method of electrify ing the air, p. 196. 7. Gold and silver vitrified by the heat of electrical explosions, p. 647. 8. All the prismatic colours produced by electrical explosions of fine wire of different metals, extended over the surface of glass, p. 679. See also the Philosophical Transactions, vol. LVIII. p. 73. In Dr. Priest.ley’s history of vision, &c. p. 434, are observations, by our author, on light transmitted through thick and thin substances. 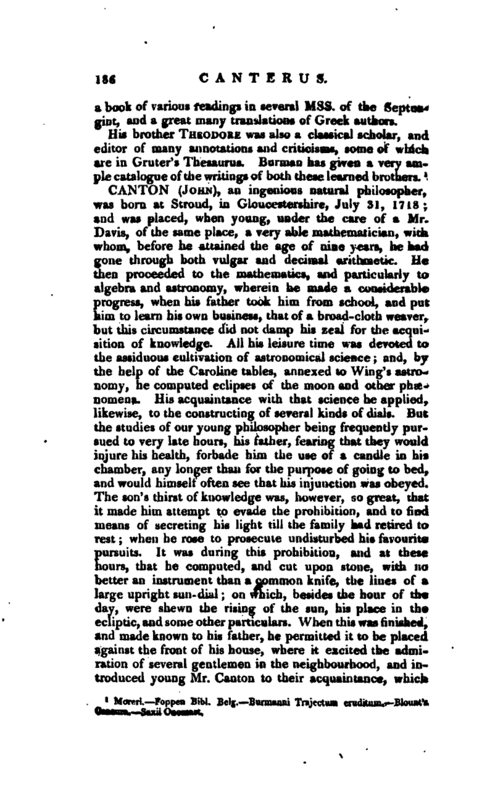 We might add, that Mr. Canton, in early life, wrote several enigmas and poems in the London and Gentleman’s Magazines. But such productions, though sometimes the amusements of the most ingenious minds when young, scarcely deserve to be particularly marked out. We may add, that he was very particular with | regard to the neatness and elegance of his apparatus and that his address in conducting his experiments was remarkably conspicuous.